Want a summery side-dish treat? Pick some firm tomatoes (romas are a good bet, or slicers that are pink instead of red), slice each one, then cook the slices in a medium-heat, greased skillet until the bottom begins to turn orange-red instead of pink-red. Flip your tomatoes over and top each with a thin slice of homemade mozzarella, a sprinkle of salt and pepper, and a little grated parmesan. Put on the lid and cook some more, just until the cheese melts. Delicious! 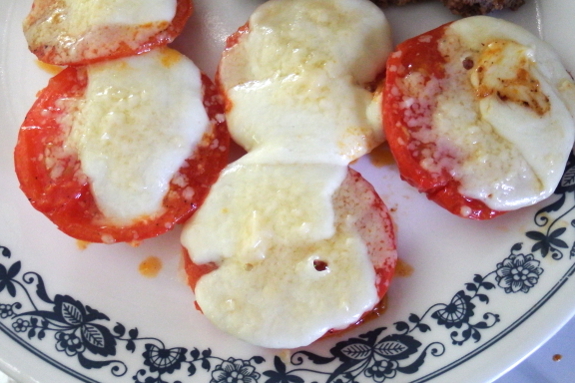 You forgot the basil, oregano and maybe some rosemary to sprinkle on the tomatoes before the cheese. And if you put these on slices of garlic bread: voila! homemade pizza!